I want to wake up at 6:30 AM every morning, and eat a healthy breakfast that I had prepared for myself. At 7 AM, I want to take a walk along the beach in a beautiful outfit, saying good morning sunshine :). Imaginary music runs through my ears, like lullabies on a peaceful summer morning. I am enough, I tell myself. I am whole. I feel the waters of the beach touch my skin, and in that moment, I feel cleansed and pure. At 7:30 AM, it’s time to get work done. You want to be a movie star, don’t you? And you want to use film and dance to bring light to global poverty and hunger don’t you? Granted, you didn’t grow up in a third world country so you don’t exactly know first hand what it’s like. You hear all about hunger, war, conflict, and disparities in opportunities in the third world, compared to a developed country. You know you can’t solve the problem, but you know that you can speak up. The next step is to spend 2-3 hours working on acting. But you need an amazing script right? So you switch the order around. You’ll spend 2-3 hours working on the script to get it amazing. It’s been 7:30-10:30 AM. So you take a break for a snack. Then you proceed to spend 10:45 – 12:45 PM working on your acting. Simplify, yet be effective. You feel pleasant because you are doing exactly what you set out to do, exactly what you want in life. You’re working for the life you want, for yourself and the world. You know the world isn’t always a pretty place, but you know that it’s your mindset that matters. You continue to see the world in a beautiful light, and it radiates in everything you do, everything you say, everywhere you go. This is who you want to be. And you must focus. You take a break for lunch. You are mindful and you are healthy. You AREN’T lazy. You eat your grains and protein, and you eat your vegetables and fruits. You take your dairy. You are mindful about keeping a good weight and being fit. You go and sit in the garden for a few minutes and meditate. By now, it’s 1:15 PM. Don’t you feel like you have all the time in the world when you live purely and pleasantly like this? But you don’t, because each day will slip by, and before you know it, you’re 23, 24, 25. You’re an adult. But cherish everyday that you are 22. Because you were once 17, 18, 19, 20, 21. And those years went by fast, didn’t they? Now you are 22. You were born on 11/22/1993. So 22 must mean a special year. You want to be forever young. You knew that you spent your young years in mania and unfocusedness, living for the thrill of it, although you always had your ambitious goals in mind. You lived wrecklessly and dipped in here and there, trying everything. Let’s just say focus and discipline weren’t your top traits. But you were young, and now you’re older, and you learn more when you’re older. You’ll be 23 in 2 months and 22 days. If you can live everyday and make it meaningful, those days will feel like years. You can die at 22 and leave a legacy. But you know you’ll probably be living till you’re at least 30. You tell yourself to remember to smile every day. Okay, you’re 22. You were once 18, now you’re 22. And you love this age. You know that you might be expected to get married, and soon be able to support your parents so they will retire happily for their rest of their lives. But you don’t feel that way at all right now, at least in terms of marriage. All you want to do is live beautifully and memorably, and leave a lasting legacy on this world, and one day support your parents like they have for you 22 years. Ok, enough talk about age, time is slipping. Ok so after some reflection, you know it’s time to get back to work. It’s 1:15, just 9 more hours till bedtime. What do you do? You look for a market for your film, constantly. You look into the American Film Market where there will be buyers for your film. This is your last shot this year, before your parents make you commit to an actual 9 to 5 PM job. You know that you’ve worked on your script, and you know you’ve been even paying for private acting lessons to improve your acting. I will repeat. THIS IS YOUR LAST SHOT. So the time you spend distracted in things that aren’t on path in the long run – you cut it out. You also know to invest in quality relationships now. So it’s been 1:15-4:15. Soon, it’ll be dinner time. You made it this far. So from 4:15 – 5 PM, you know you can’t always be by yourself all the time. You take this moment to plan for the Meetup Group you created that is meant to unite people of similar interests as you. It’s called the Global Poverty and Hunger Alleviation – Art and Action group. You decide that you’ll schedule a few meetups for the next month – you’ll teach about the subject on behalf of United Nations World Food Programme at middle schools. You’ll plan to visit your local congressman to talk about the issue and get their opinions. You’ll create possibly an art show to raise awareness. You’ll continue to find ways to be a young adult story presenter for NAMI. You’ll do the training for slides presenter as well. That way, you’ll be around people at least some of the times while you’re living back home with your parents and it feel all you do is work from home all day. But this is what you signed up for, and you know that you’ll persist and that you know that every day will be pleasant, because it’s in your mindset. Remember, you continue to see the world in a beautiful light, and it radiates in everything you do, everything you say, everywhere you go. At 5 PM, you do your 15 minute ab workout, and then you eat dinner. Once again, you AREN’T going to slack off on health. You eat your protein and grains, and you eat your fruits and vegetables. Without health, you have nothing. You take a comfortable shower, maybe even a nice bath, and you’re ready for the rest of your evening. It’s 6 PM. From 6-9 PM, you’re going to finish your application to the Peace Corps. If you get selected, you’ll get to spend ages 23-25 in a third world country! After being a movie star of course. Yay! The day your dream comes true, you can rest easy, but for now, it’s important to keep up consistent and good habits. You’ll anticipate that things will get boring here and there, but you’ll keep persisting because what separates the successful from the not is that the ones who succeed are able go through day in day out working, no matter how tough it can be, because they know that it takes good habits to create success. Okay, yay! Its 9 PM. Don’t give up yet girl!! You’ll spend from 9-10 PM practicing your dancing every single day. Stretching, choreographing, creating at least one dance a month. And you’ll showcase them too. Home stretch, 10-10:30 PM, you’ll wind down, reflect, and read, no electronics, and you’ll be ready for tomorrow. And this is what you’ll do every single day. Some of the tasks may change here and there, but at least now you’ve planned out how you want to live your life. You know that you’ve been living with your parents for almost a year since graduating, and it’s time for a change of scenery. If you get the movie deal, you’ll get to go to Los Angeles. If you get selected for Peace Corps, you’ll get to be abroad on a new adventure for two years. Remember, you continue to see the world in a beautiful light, and it radiates in everything you do, everything you say, everywhere you go. Because you tell yourself you are worth it. You are exactly who they are looking for. Everywhere, you look for evidence that the prize is yours, and that you are beautiful, and worthwhile, and capable of creating a lasting legacy in this world. It’s been about seven months since I last blogged. I’ve been busy living a life that is meant to be kept secret. But how does one keep a secret that has affected her for so many years that it becomes a burden to carry? I completed my studies at UCLA last year! Two years goes by fast. I remember my first day as if it happened just yesterday. I’d say those years were the more happier years of my life. I felt fearless, but perhaps much of that fearlessness came from an unexpected “mental illness” doctors thought I had, which is schizoaffective disorder – or in other words schizophrenia and bipolar disorder (manic depression) combined. Somehow, when I was first struck with it at age 18, it made me brave. But being at UCLA itself as a transfer, I wanted to and was ready to seize all of the opportunities, so I felt more daring and bold. During my last quarter at UCLA, I was struck with my second episode of schizoaffective disorder, but I managed to finish my studies on time for graduation. After graduation, I attended a partial hospitalization program for ten weeks before I moved back home to work full time on my feature film script “A Dance to World Peace” and Project #DanceToEndHungerNow. “A Dance to World Peace” is a drama/call-to-action film about a schizophrenia and manic depression diagnosed girl, Daisy, who attempts to alleviate global hunger and poverty with awareness through unity of dance from all over the world to raise awareness for the cause and to create world peace. Sometimes, I can picture myself being like the homeless on the streets, had it not been for my family. They may not have the support system (psychiatrist, therapist, family and friends) I am fortunate to have. They wander and due to possibility of schizophrenia and/or other mental illness, they act in ways that mentally healthy people do not always understand. There is a deeper layer and root cause to the mentally ill that professional caretakers/health care professionals may not always understand, which makes it harder for them to help us. I believe that one’s life should be looked at holistically from beginning to end when it comes to treating mental illness – the experiences (both positive and negative) that one grew up with, their triggers, their hopes, dreams, wishes, and their mindset. 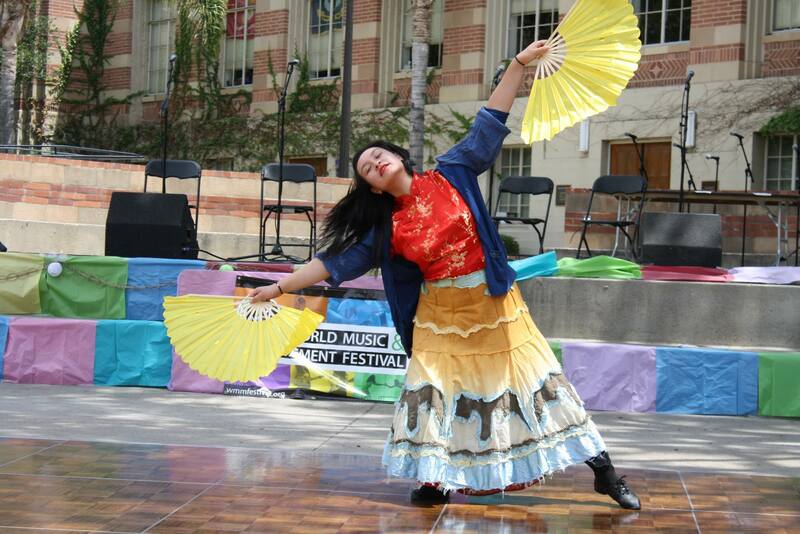 For me, schizoaffective disorder also gave me something I am lucky to have – a sense of creativity and pursuit of a grandiose life purpose — to alleviate global hunger and poverty with awareness through dance and film. Unfortunately, it also came with occurrences where I would try to communicate my desires and hopes, and no one would understand me because I was “manic” and “disorganized”in my speech and actions. My life feels like a movie. I see everything happening beautifully. The world is a beautiful, complex, and amazing place, but it has the potential to be a better world more suitable for all types of people. There is injustice here and there and not everyone gets represented or has their needs met. I’m 22 now, all grown up. I never knew my life would be changed and play out this way, and I truly hope that “A Dance to World Peace” will play in theaters internationally and that Project #DanceToEndHungerNow will make a difference to people. I also hope to help and inspire people who have gone through what I am going through right now. For my time is limited, I want to make each day count. If I had only changed myself first, then by example I would have changed my family. From their inspiration and encouragement, I would then have been able to better my country, and who knows, I may have even changed the world. I’m not entirely sure of the author’s name in English, but I felt this passage really resonates with me. All we have is now, so why not make the most of it? Hello friends, I’m feeling really good and I thought I should update you on my film journey! SO MUCH has happened since my last blog post on February 24, 2014 titled “Update on my dance/filmmaking journey!” If I didn’t write it all down, I don’t know how I would keep track of everything that happened. Time continues to pass and I continue to work step by step, one at a time towards my film dream. Of course, I want to share it with you all because it makes it all the more meaningful to me if I can share my experiences, both good and bad, because either way, we all learn from our experiences! Soooooooo, I’m now 20 years 4 months and 21 days old, barely starting my twenties, the best decade of my life, yet it feels like so much has happened! I feel excited and happy inside when I think of the potential of making a film to change the world. During my last post “update on my dance/filmmaking journey” from February 24, 2014, we left off with me talking about how I started to abide by a series of new year’s resolutions and about what I did since I turned 20 on November 22, 2013. December passed, January passed, and february was nearly over, and I spent those three months (my first three months of being 20) on four SMART goals, on participating in Entertainment Networking Night (on 1.29.14), Non-profit Networking night (on 2.19.14), and on embarking on a visit to the UCLA School of Theatre, Film, and Television (on 2.20.14). I guess by now, I should tell you what my new year’s resolutions are, because now you can hold me accountable, and also because I hope they can help you in your journeys too! 0. Be on time to class and all appointments. 1. Work on being mentally strong. 2. Try to make a reputation for myself and establish myself before or by age 21. 3. Be nicer to everyone, even people who dislike me. Treat everyone equally. 5. Keep busy everyday, leave no open hours. 7. Find some mentors who are older and wise than I. 8. Take care of myself and my body. Love myself unconditionally. 9. Review life hack for the twenty year old (I have a binder devoted to life hack). Review my tumblr posts and yellow notebook agenda (also consisting of tips and goals personal to me) often. P.S. #6, 7, and 9 have been hard to do consistently, but I promise I’ll work on them harder! Great, now that I’ve revealed to you my 2014 new year’s resolutions, I will continue telling you what’s been happening with me since we last left off on February 24, 2013! FROM HERE ON OUT (as it has been since my 20th birthday and since the new year 2014), my primary focus in life is constructing my film, “World Peace Dance” (title has been changed to be shorter and more appealing) — from writing the script to gathering a following through youtube videos and teasers to actual dance performances/shows, and to selling the script and getting the film produced and shown in theaters internationally. Sounds like a lot of work right? But to me it’s actually very simple because all of the work boils down to this — getting “World Peace Dance” released in theaters (both domestically and internationally) to create an impact on the world. 1. On February 24, 2014 (in midst of winter quarter 2014 at UCLA), I went to audit a class at the UCLA school of Theatre, Film, and Television in order to learn more about screenwriting so that I could better know how to construct the script for my film. The name of the class was Film TV C132 Screenwriting Fundamentals. 2. On February 25, 2014, I was invited by my friend Nate Boyd, MFA screenwriting student at UCLA, to audit one of the classes he was in, Film TV 298A Special Studies in Film and Television. There, at the beginning of their class, I asked the professor if I could make a short pitch to recruit screenwriting collaborators for “World Peace Dance” (named “A Dance to World Peace” at that time). I had little luck in this feat, but told myself I was going to be okay and that I would keep searching. 3. 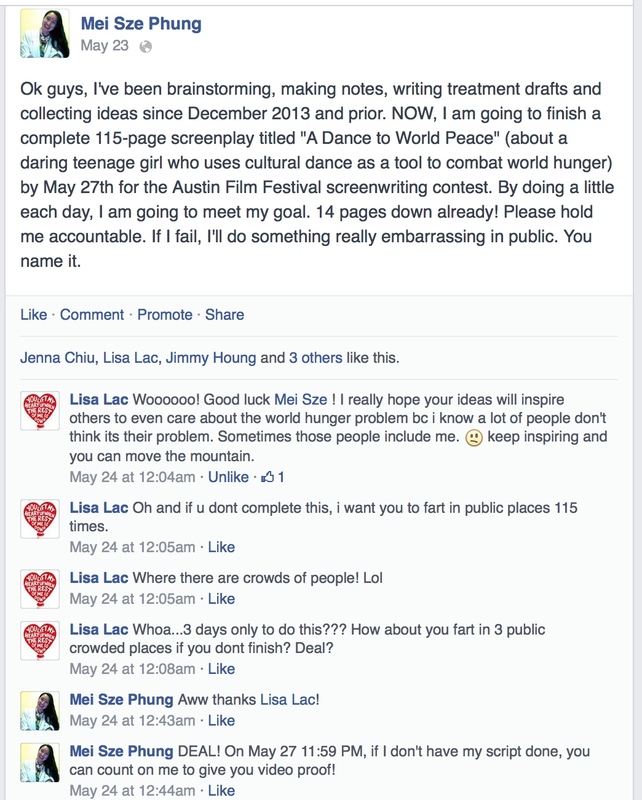 On February 26, 2014, I embarked on the mission of starting SMART goal #5, which consisted of revising my treatment based on Feedback Group #1 (Linh, Ziying, and Cynthia) and testing it on a new feedback group, which happened to be a screenwriting group in LA (see #4). 4. On February 27, 2014, I attended the very first meeting of a screenwriting group hosted by Meera Peermohamed, a member of the facebook group Berkeley Film Friends (BFF which I am part of). This was a great opportunity because it allowed me to test my treatment draft #2 (that had been revised based on the feedback I received from Linh, Ziying,and Cynthia) to the writer’s group so that I could begin to draft treatment draft #3. The writer’s group was a fantastic experience because I got to meet new people and receive quality feedback on my treatment draft #2. Thank you Meera for hosting the very first meeting of this screenwriting group!. 5. On February 28, 2014, I attended the event “Entertainment That Matters: A Conversation with OSCAR-nominee Steve McQueen” at UCLA. I was super stoked because Steve McQueen was at that time, nominated for Academy Awards for his film “12 Years a Slave”. The thing that I remember most remotely about this event was when an African American told Steve McQueen during the question and answer period of the event that sometimes he felt as if he were the only black in the room and asked Steve McQueen how he dealt with being an African American filmmaker. Steve McQueen responded that he didn’t let it bother him. No matter who was around, he would do HIS job no matter what and stay focused to finish his job. It didn’t matter if he were the only black in the room or not, he did HIS job. At that moment, the crowd cheered and clapped. 6. During the evening of February 28, 2014, I attended “II”, a dance show featuring Laurel Jenkins Tentindo and Kevin Williamson, MFA students in the department of World Arts and Cultures at UCLA. This show was really inspiring and beautiful because it showed me the power of creating exquisite, meaningful, and moving dances from personal stories near and dear to oneself! After the show ended, the performers received a standing ovation! 1. On March 2, 2014, I watched the Oscars, the 86th Academy Awards ceremony. How could I not? 2. This was crunch time for me! I was at weeks 9 and 10 in my winter quarter at UCLA. I found it hard to balance both school work and film work. I felt like there was not enough time in a day. I was tired from being sleep deprived, which led me to have a sleep schedule of abnormal hours. It was like I was staying up during the night trying to finish all of my work, and then spending my days napping for long hours. Thus, I was advised to focus on schoolwork for the rest of the quarter, and then when the whole winter quarter is over, work on my film. 4. 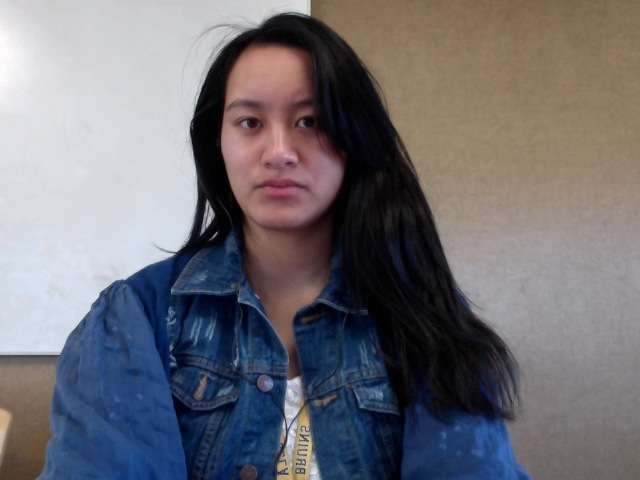 So on March 19, 2014, the winter quarter finally ended for me and it was time to go home. Unfortunately, that day I had a packed schedule and didn’t have enough time to pack before I went on my bus ride home to the Bay Area, so my bus ride home was delayed for a day, and I went home on the morning of March 20, 2014, just in time to see my sister during her last day in the United States before she embarked on a journey to Japan on the morning of March 21, 2014. It was clearly an incident of bad time management on my part, but I learned my lesson to always devote substantial time to packing before leaving to anywhere. 5. I spent the first few days of Spring Break sleeping for long long hours. I didn’t know why my body felt so tired all the time. It was probably because I had an irregular sleep schedule during winter quarter 2014 finals week at UCLA. This made it hard for me to be productive, but I found time to work on my collecting and organizing files for my acting/dance/film reel (to show film producers), as suggested by Sunny Tripathy, a UCLA alumni whom I had met at Entertainment Networking Night in January 2014 (for more info about my experience at Entertainment Networking Night, see blog post from February 24, 2014 “Update on my dance/filmmaking journey!”). 6. On Saturday, March 22, 2014, I revisited all of my SMART goals and even came up with my 6th SMART goal: to revise my treatment draft #2 based on Meera Peermohamed’s BFF screenwriting group and come up with treatment draft #3, which I would then test on a new feedback group. SMART goal #6 is my most recent SMART goal, which I am working on to this day :). 7. Guess what happened on Sunday, March 23, 2014 at 9:00 PM? 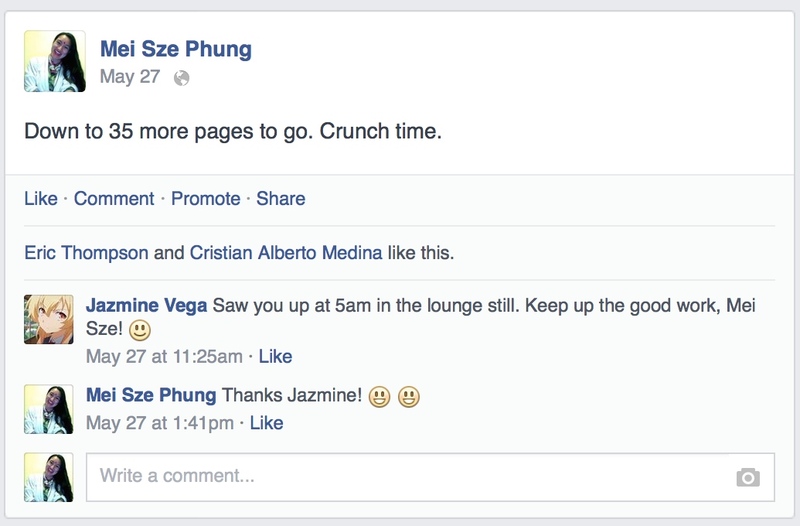 I created “Mei Sze Phung’s Plan for the last 2/3 of her year 20 AND beyond for the next few years”. This crucial document has my plan for the progress of my film as it runs from pre-production to post-production and marketing (as of today, this document is taped on my closet door in my dorm at UCLA for me to see and review on a consistent basis) :). 8. On March 25, 2014, I watched “The Pianist”(2003). Loved this movie! I had also watched “A Beautiful Mind”(2001) on March 10, 2014, and “12 Years a Slave”(2013) on March 12, 2014. 9. 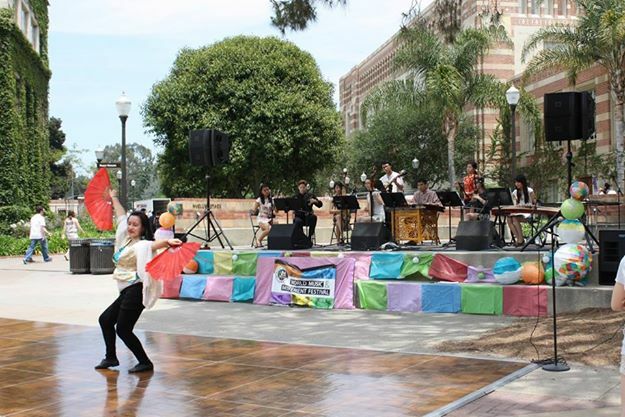 On March 26, 2014, I heard back from Ken Rudnick, a fellow UCLA student who had expressed interest in collaborating on writing “World Peace Dance” (at that time named “A Dance to World Peace”). I was really thankful to get a new perspective on “World Peace Dance” because Ken had provided me with detailed notes on how I could improve treatment draft #2 to create treatment draft #3 based off of Feedback group #2, Meera Peermohamed’s screenwriting group. 10. During the evening of March 26, 2014, thanks to Tyler Smalls, I started thinking about garnering a following for “World Peace Dance” through creating cultural dance youtube videos for the purpose of spreading awareness about global hunger alleviation. Thanks Tyler! This would be a great method to complement my theatrical film with methods of social action and intervention in the real world. 11. Even later that evening of March 26, 2014 (around midnight), I finished watching the entire video portion of Stephanie Palmer’s online course “How to Be a Professional Screenwriter in Hollywood”. Definitely super helpful! It gave me an overview of how the film industry works, while also providing me with details, tips, and tricks on how to thrive in the industry as a writer. 12. On March 28, 2014, I watched the films “Noah” (2014) and “Precious”(2008) with Ziying. 13. On March 31, 2014, spring break ended and it was BACK TO SCHOOL TIME!!!!!!!! I couldn’t wait to start getting productive again! 🙂 🙂 :), especially after a long sleepy spring break. 1. On Tuesday, April 1, 2014, I met Ken Rudnick for the first time in person. It was the second day back at school. Ken and I went through his original comments on Treatment draft #2 of “World Peace Dance” (named “A Dance to World Peace” at that time) and my notes from Meera’s screenwriting group in detail in person. It was a great time being able to discuss my film in detail and the possibilities. I was really starting to feel that “World Peace Dance” was beginning to come to life! 3. Brace yourself!! From April 11 to April 14, 2014, I am participating in the Online Hollywood Pitch Festival. If you don’t know what that is, it is a monumental milestone in my film career because it basically means that I get to pitch my film idea to FILM COMPANY REPRESENTATIVES!!!!!!!!!!! This means that if the representatives like my idea, they might decide to set up another meeting to talk more with me or even buy my project. I pitched to the VIPs from three film companies. I’ll jump to the good news: During my second Skype pitch meet, which was with the film company Eclectic Ent., I got to speak with Conor Charles (Sr. VP Production) and Kyle Cooper (Development). It started off pretty well because I felt like I had a bond with them when we build rapport prior to my pitch. They both seemed fairly young too! I pitched my log line: “World Peace Dance” is drama with dance mixed with thriller and action feature film about a daring teenage girl named Daisy who is on a mission to alleviate world hung through cultural dance to create world peace, but she ends up starting WWIII. We the continued and I walked them through my film. They told me that my film was perfect for them because they were looking for female leads. We were really excited talking about my film, but then I was told that my film, because there was so much dance in it, might be better suited for theatre/stage. BUT, Conor told me to give them a call at the end of this summer/beginning of the new year do update them when I have made a play or a multi-video project and gotten a following started. I was asked to invite them to my performances!! I was told that I had a kernel going (that could grow). I was also told that I would be remembered and that they would buy my idea in heartbeat, but my film was too big-budgeted at this moment and was also a RISK project. I was really really happy after this Skype meeting because I felt that there were people who believed in my film idea and that they were excited to see my idea grow. It made me feel really good and happy. I could see my whole film play out in real life and I couldn’t wait for it to happen. I felt so much hope and ambition because it seemed like my dream would actually be coming true. Do you know what I mean? So that’s my gist of the Online Hollywood Pitch Festival, I have one more meeting with a film company VIP this Monday, so stay tuned! 1. Make my own “cultural dance against global hunger” youtube/dance movement(s) in real life (collaborate with the UCLA dance department and UCLA film department). 2. Turn my “World Peace Dance” film treatment into a script. 4. Appreciating solitude – I’m really starting to like my alone time, do you know what I mean? I enjoy being around people, but I also really appreciate when I have time to think to soothing, beautiful music and to utilize my creative juices to come up with something phenomenal. 2. Applications to a variety of prestigious screenwriting competitions (thanks to the suggestion of my Film Producing III professor Hans Liebing, as well as Weiko Lin and Rocco Pucillo (both of whom I met at Entertainment Networking Night). 3. REALLY excited for this! — making actual “cultural dance movements against global hunger” in real life to garner a following. 4. Turning my “World Peace Dance” treatment into a script. 6. Selling “World Peace Dance” to film companies. 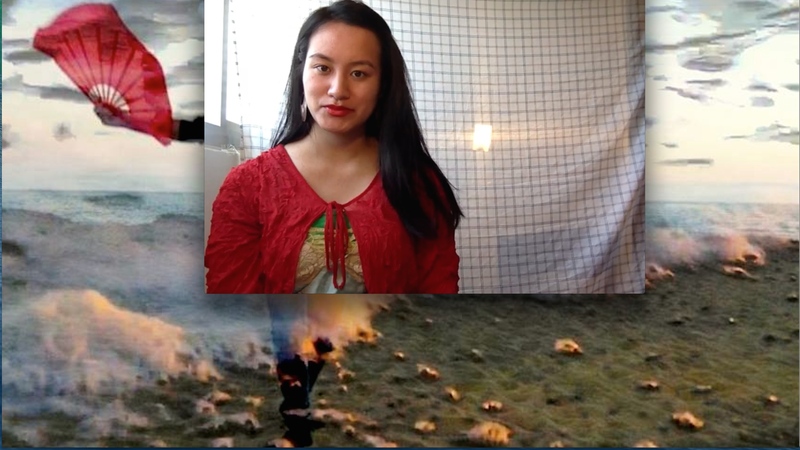 Hopefully, pre-production, production, post-production, and marketing of “World Peace Dance”! Thats it! I’m so glad that you were able to read through my post. I hope that I have inspired you to follow your dreams too! P.S. Have a great year 2014. 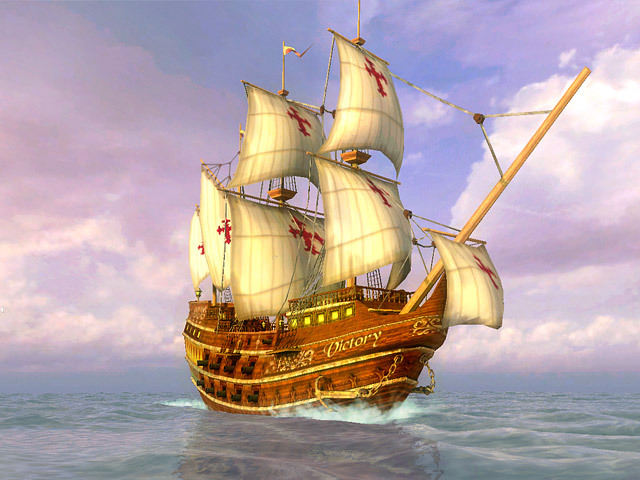 I hope that your dreams come true — transcend all limits and boundaries. I believe you can do it. Update on my dance/filmmaking journey! It’s been about two months since I first launched the blog “My Road to becoming a Filmmaker and living my Hollywood Dream”. I am happy and excited to tell you all that a lot has happened since then and that I wouldn’t feel complete if I did not tell you all about it! My fall quarter at UCLA ended on December 13, 2013 (as a transfer student, it was only my second quarter at UCLA, after the summer sessions head start I completed during summer 2013). At that moment, I knew I needed to change something about my life. My friend Ziying and I proposed to share with each other our 10 new years resolutions and count on each other to follow through with all of them (since then, I have condensed and revised them down to 9). I’ll keep them secret for now, but what I will tell you is that working on them and following through on them has brought me tremendous changes in my life: I became more productive, happy, energetic, and mentally strong everyday. 1. I made the decision to commit to doing five tasks towards my film dream every day to get it rolling. 2. I created my list of ten New Year’s Resolutions for 2014, printed them out, and exchanged them with my friend Ziying. 3. I discovered the work of Stephanie Palmer (author of Good in a Room – How to sell yourself (and your ideas) and win over any audience and founder of consultant company Good in a Room). 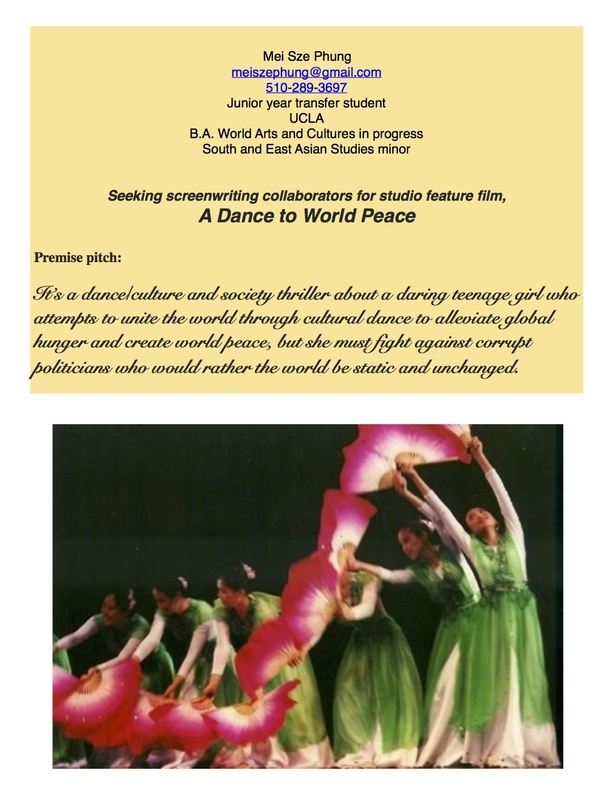 Thanks to her book and her blog, I learned of steps that forced me to become clear about what my movie, “A Dance to World Peace” would be about. I learned about how to pitch my film title and logline to my friends and family. 1. I started my first official SMART goal (you can google what it means for clarification) on January 7th, 2014, and completed it by January 15th, 2014. SMART goal #1 consisted of completing the six steps: Coming up with the film idea, brainstorming related ideas, researching the idea, drafting revised short pitch, and testing the revised title and pitch. 2. I actually spoke to Stephanie Palmer on January 17th, 2014 on Skype for a fifteen-minute session! She was extremely helpful and gave me more ideas on how to further the progress of my film, “A Dance to World Peace”. 3. I started SMART goal #2 on January 17, 2014 and finished it on January 26, 2014. SMART goal #2 consisted of the following steps: Outline the Project, edit the outline, and outline the story. 4. I took advantage of Entertainment Networking Night at UCLA on January 29, 2014. This was a huge event where UCLA alumni in the entertainment industry came to speak with UCLA students. I spoke to about 9 people that night, making connections, retaining business cards and emails. That night, I stayed up until 4 AM to send follow up emails to the alumni I spoke to, thanking them for their time and for allowing me to know what the next steps in my film career dream were. Time only continued to move quickly. As if I were on a treadmill, I felt myself having make the effort to keep up with the fast pace of time. After all, I only had 24 hours in a day, and about five days a week, I had to attend my UCLA classes, go to the gym to work on my physical therapy stretches, eat dinner, do my homework and much more of the typical day to day tasks one does. About two days per week, I attended ballet and belly dance classes. What was left of my day to work on my film each day was usually only a few hours out of the twenty-four hours of a day, but I persevered and looked forward to those few hours each day. Each night, I struggled to get the 7-9 hours of sleep that an adult needs to properly function, sometimes getting less than 7 hours because I had been in the momentum and zone of working on my film and it was hard to stop working. 1. On February 4, 2014 I started SMART goal #3 and completed it by February 16, 2014. It consisted of converting my story outline into a three-page treatment. This was my opportunity to identify story problems. 2. On February 17, 2013, or Presidents’ Day, I started SMART goal #4, which consists of testing my 3-page treatment to a feedback group. For this group, I chose my sister Linh, Ziying, my brother David, my floormate Cynthia, and my RA Anthony. I felt happy to be able to hear their feedback and criticism (from those who I received feedback from so far). Like Michelle Kwan says, “I can take criticism. It’s when I DON’T get any that I worry”. Having been inspired by Michelle Kwan, I am starting to feel the same way too. 3. I took advantage of UCLA’s Non-profit Networking Night on February 19, 2014 to learn more about the causes of hunger, poverty, and homelessness as well as the work that different non-profit organizations were doing to address those issues. I knew that at this stage in my life, it is essential to seize opportunities as they come. Worried that I was on the wait list and might not get in, I went there early after dinner. But I guess it was my lucky day because upon my arrival at the check-in station, I was told that I was actually not on the wait list! So I happily went to the panel and listened to five representatives form different non-profit organizations talk about their career paths and the organizations they worked for. After that, the official event began and I went from table to table to meet and talk with the different non-profit organizations working to alleviate poverty and homelessness. Once again, it was an eye-opener experience because the representatives gave me a lot of information, allowing me to realize what my next steps would be — 1. to commit myself wholeheartedly to non-profit organizations that I feel strongly interested and connected to 2. to experience the hunger and poverty in third world countries first hand and try to make an positive impact directly at the sight because it is a lot about how I feel and what I experience that helps me to write my film script. 4. On Thursday, February 20, 2014, I went to UCLA’s school of Theatre Film and Television (TFT), as my friend Nate had invited me to come listen to guest speakers such as the writer of Avatar, the editor of Scream, and three UCLA grads who made the movie “The Raid” (2011) and “The Raid 2” (2014). I also audited a professional screenwriting class, listening attentively to a the discussion that centered around one of the five students’, Anthony’s, script. 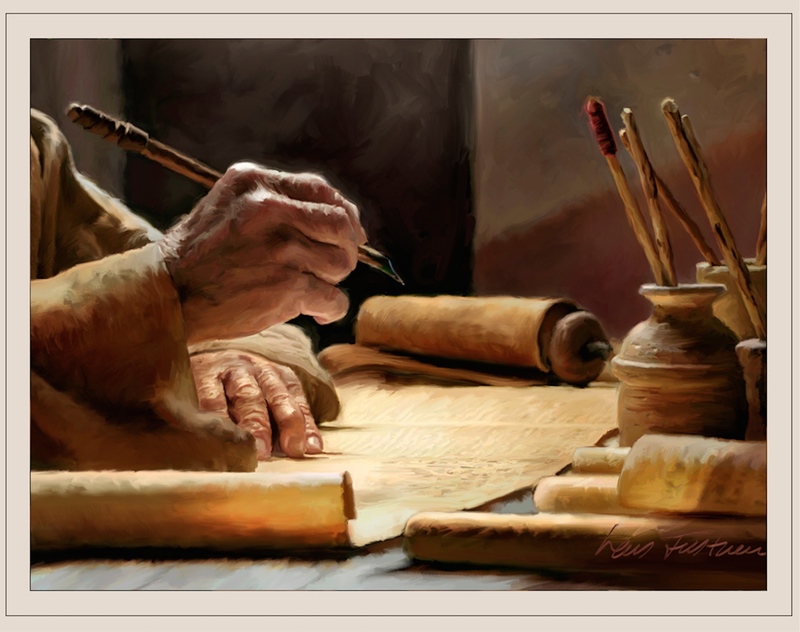 I took notes about the details and elements that a script must encompass, knowing that these notes would be important to address as I write my own script as well. My night visit to UCLA’s School of TFT was a learning experience for me because I was allowed to ask questions on what I was curious about. It was also a chance for me to connect and talk with members of the TFT department. I am forever grateful to Nate for inviting me along to TFT to learn that night. I am also thankful the professors whom I met, James Strain and Howard Suber. And of course, thank you to all of the TFT students I spoke and connected with! Once again, I sent follow-up emails, Facebook requests, and linkedin requests to those I met at Non-profit Networking Night and at my UCLA School of TFT night visit (as I had done so for Entertainment Networking Night as well). I have posted this flyer around the UCLA World Arts and Cultures Department, UCLA School of TFT, and on many Facebook film and screenwriting groups. I have had several inquiries and people interested, but no definitive collaborators so far. The world doesn’t end here though. I am persevering and doing as much as I can on my own and I believe that when the time is right, I will find the right collaborators. If you are interested, let me know! We can talk! I hope that I can find international collaborators too. My dream is for my film to not only be shown in theaters all over the world over the next few years, but for it to also create a real impact on the world against global hunger and poverty. Thanks for listening to my journey so far! I know it is a lot to take in! I am happy with my progress so far and have faith that I will continue to progress until my dream becomes a reality. 1. Applications to a variety of prestigious screenwriting competitions (thanks to the suggestion of my Film Producing III professor Hans Liebing, as well as Weiko Lin and Rocco Pucillo (both of whom I met at Entertainment Networking Night). Haha! Just kidding. I will stop here (for now). THANK YOU SO MUCH for joining me on my journey. I am forever with gratitude to you. Have a great year my friends 🙂 I hope that your dreams and aspirations come true. I just read a book that details your childhood to your adulthood and later life. I want to tell you that I am so impressed by you and you inspire me a great deal. I wish I had the courage to be more like you. You are so brave. You keep trying. You are persistent. The story of your life is so heartfelt. I am really in awe finishing your book. You are a great role model. I saw many of the struggles you went through while reading the book, and I am encouraged to ply through my struggles too. Life has not been easy for me, but I am happy to be where I am now. I can’t believe you knew you wanted to be a movie director when you were 12-13 years old. No 12-13 year old I know is like you. If I could, I would want to stay teenager forever, but I can’t, but at heart, I know I will always be a kid, because we all know that passion starts when we are kids. We already know what we love and desire because our heart tells us so. Also, your baby pictures and pictures of you as a kid were so adorable! You looked mischievous and and adventurous and I see that in myself sometimes too. What really blew me away is how you never stopped trying and you never seemed to even take a break. You just kept going and going. Anyways, thank you for inspiring me. “There is no time to lose” is my motto. My passion has always lied in the arts and in dancing, and sometime between high school and college, I knew that I wanted to make movies. I’ve made a list of 10 resolutions for the new year with Zi Ying Liu, which we will both push each other to accomplish. They’re secret now, but someday you will find out what they are! These resolutions mainly outline ways for me to reach who I want to be as a person and who I want to be as a filmmaker and arts activist. Everyday, I have vowed to myself that I will do at least five things to achieve my film dream. I started this Monday, and so far things have been going well. I am also working on becoming the best dancer I can be. I am still recovering from two leg injuries, but through these injuries I have learned to take much better care of my body. I can dance again, but I have to slowly build up. 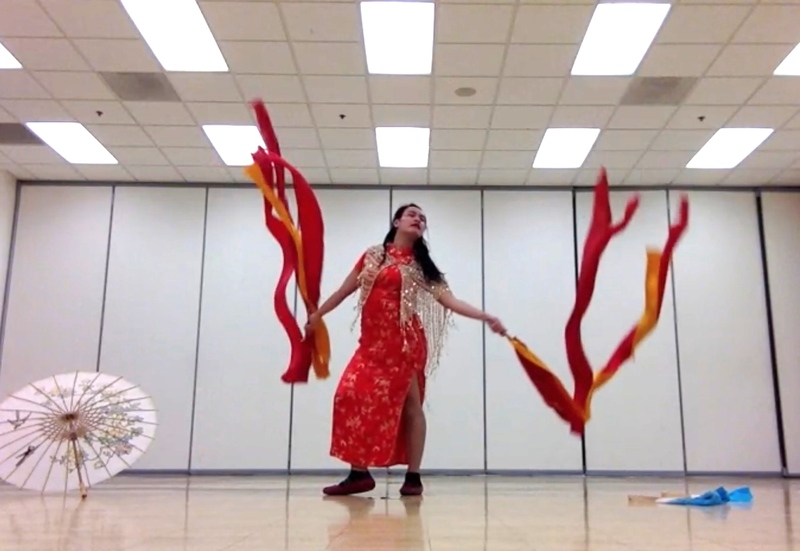 I do mainly Chinese dance and cultural dance, but this winter quarter, I am excited to be taking ballet (resuming) and belly dance (haven’t done this since my freshman and sophomore years of high school). I love exotic dances such as Indian, arabian, egyptian etc. They are a lot of fun and the music is so catchy and alluring. My other hobby is reading. You won’t believe how many books I have checked out from the Alameda Free library, and CD’s too. I love new music and books. 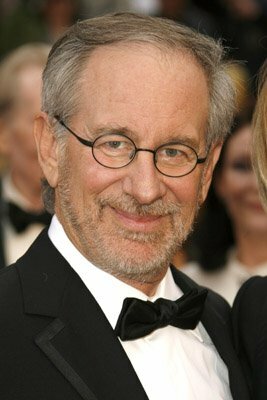 I’ve checked out books on Spielberg bios, Disney and Warner Bros bios, Chinese culture books, a geisha memoir, film books, Chinese Zodiac books, etc etc etc. When I go to find a specific book, I grab it, but then I look around the shelf at the books on similar topic surrounding them, which makes me graph 3 or 4 more books when I originally intended to just grab one. It’s great, and I hope I can finish all of them or at least take in the significance of each. My goal is to read one book a month from cover to cover. I feel that this will really inspire me even more. It’s getting late, so have a good evening! Stay tuned! I will keep updating. I am super excited to go back to UCLA for winter quarter, but before then, there is MUCH MORE that needs to be done. I will stay strong and firm about my passion and it will never change. I can picture exactly who I want to be by or before 21. I know exactly what I want. And it has been great. I don’t ever feel like I am wasting time when I take actions towards what I want and who I want to be. I hope that I can inspire some of you along the way to achieve your dreams too in pursuing my own dream.